Neutrophils play essential roles in several inflammatory reactions. Oxidant/antioxidant imbalance is thought to be partially involved in the pathogenesis of the disorders. Under the conditions of oxidative stress, superoxide dismutase (SOD) acts as an endogenous cellular defense system to degrade superoxide (O 2 − ) into oxygen and hydrogen peroxide. Therefore, SOD is potentially useful as a therapeutic agent for treatment of inflammatory disorders. A further mechanism that may contribute to the efficacy of SOD is the regulation of neutrophil apoptosis. For the resolution of infl ammation, the activated neutrophils must be safely removed by apoptosis. Neutrophil apoptosis has been suggested as a possible target for the control of neutrophil-mediated tissue injury. Exogenously added SOD induces neutrophil apoptosis, and hydrogen peroxide has been suggested to be a possible major mediator of ROS-induced neutrophil apoptosis in a caspase-dependent manner. 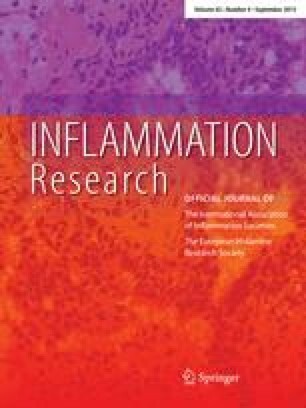 If the drug can be delivered efficiently to the inflammatory site, SOD may be useful as an inhibitory mediator of neutrophil-mediated inflammation.